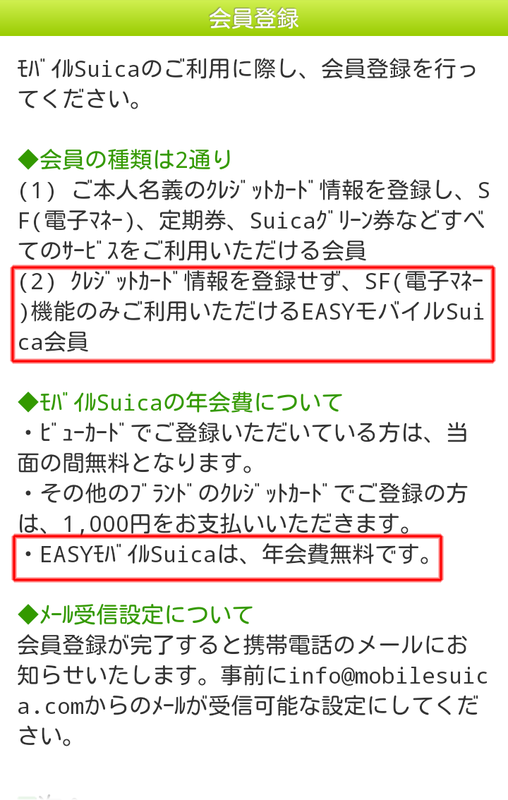 With the EASY Mobile Suica option, none of the options are usable. 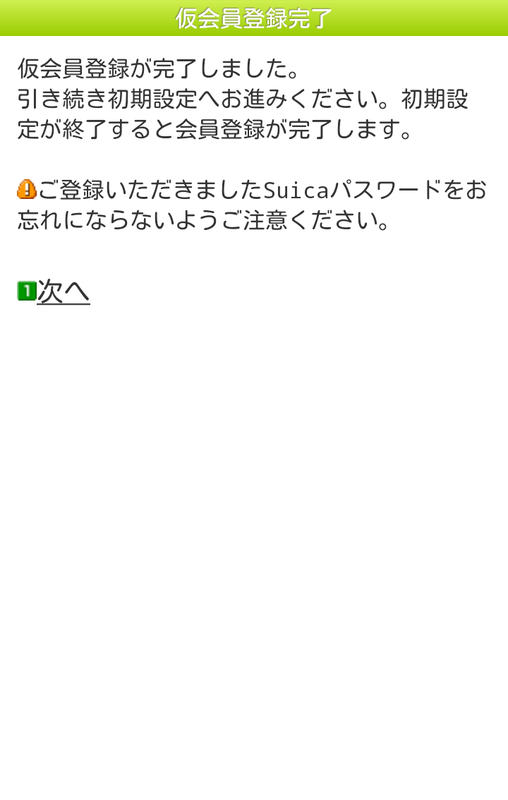 In fact, there's probably no reason to open the mobile suica app ever again. 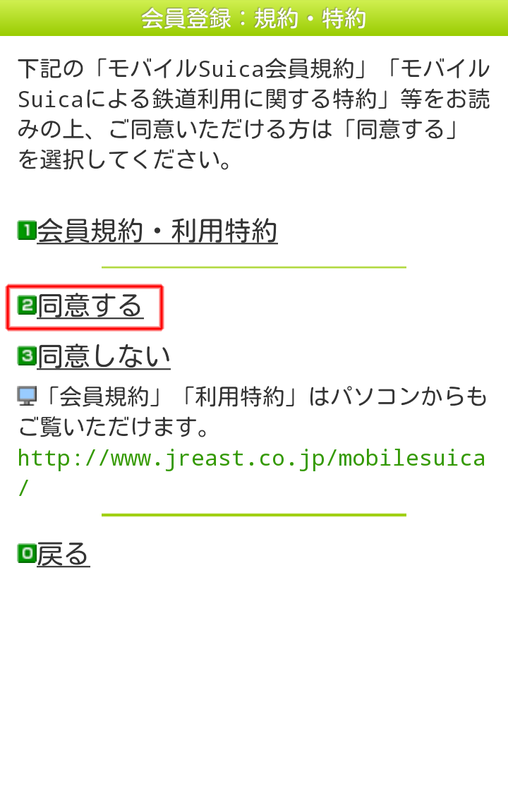 It's may not be immediately obvious, but there are two options for registering for JR East's Mobile Suica app. (have I mentioned that it's ugly?). The standard registration requires a credit card and, unless it is a JR East "View" card, payment of a yearly ¥1,000 fee, which seems ridiculous if you only want to charge your rail pass for riding trains and buying conbini onigiri. 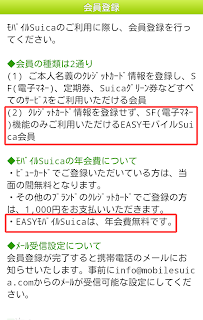 Fortunately, there is also an option "Easy Mobile Suica" which offers few options but is totally free. You cannot use this to by "green car" tickets, express tickets, or commuter passes. The charge can be used for purchases where Suica cards are accepted and there is an option for adding money via a bank account. 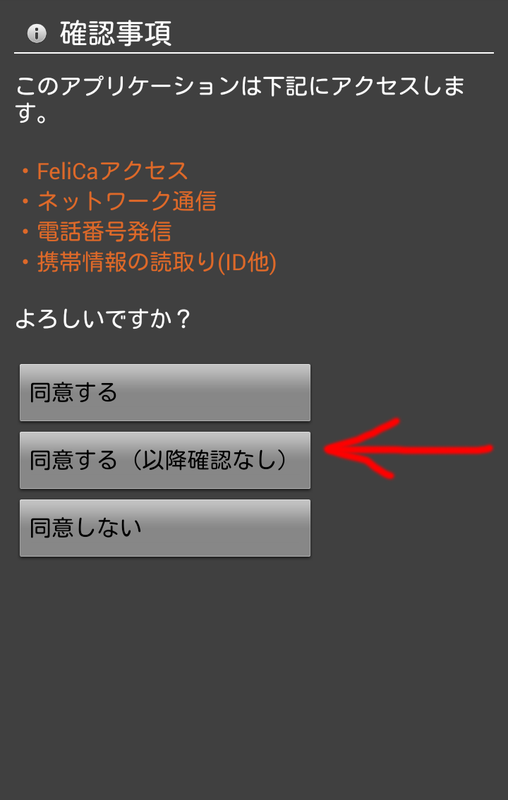 The status and balance on all of your FeliCa apps can be checked through the master Osaifu Keitai app. As can be seen below, this also has an option to show the apps using the NFC element embedded on the SIM card (That Docomo calls a UIM card). 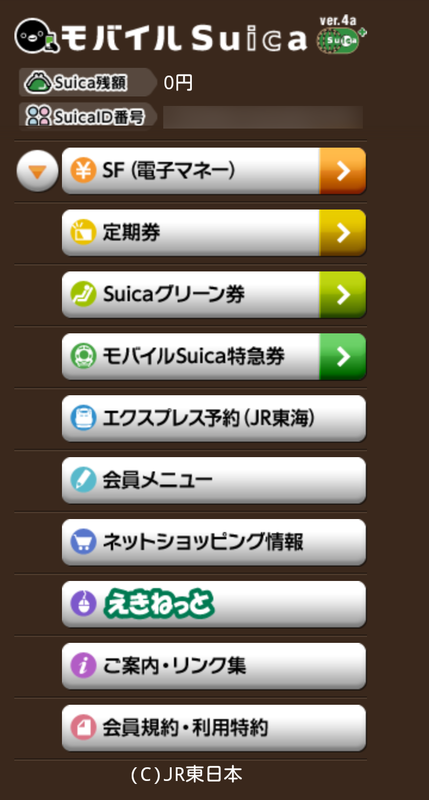 This is good because you get the information you want all in one place, without having to open the (ugly) Suica app. 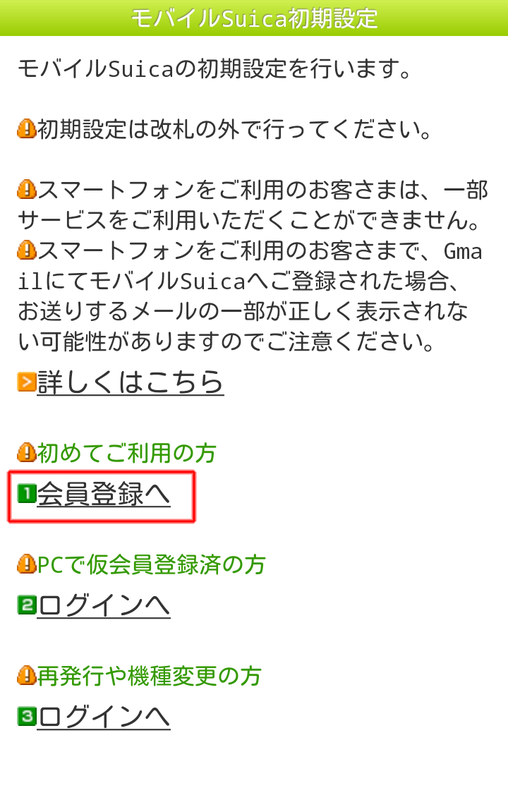 Registration for EASY Mobile Suica cannot be done on a computer - only via the Suica app. Here's how I did it. Once you've downloaded the app, start it up and follow along with the screenshots below. 1. The apps permissions are displayed: accessing Felcia, network communications, making phone calls (no idea why it needs that), and reading the phone's ID. Tap agree 同意する（以降確認なし）. 2. You are next presented with the first start page. There is a warning that if you chose to register a gmail address, that some mail contents may be displayed improperly, meaning that they are breaking email standards when the spam you. tap option 1, new registration 会員登録. 3. 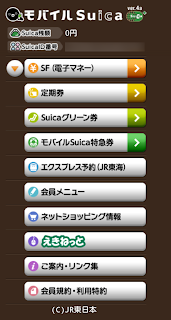 The next screen explains the two options for mobile Suica, as I described above. 4. Continue to the next screen and tap option 2, agree 同意する. 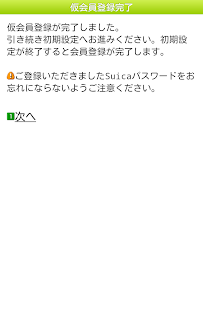 If registering for the full Suica, you can do that at the webpage listed, but Easy Moible Suica requires use of the app to register. 5. The cost and included services for the two options are shown next. To register for free version without a credit card, chose option 2, クレジットカードを登録しない（EASYモバイルSucia）. 6. The actual registration step. The items marked with ※ are OPTIONAL. Enter something for a name if FULL WIDTH characters. I used English. For example: ＳＢ for my first name and Ｓfor my last. 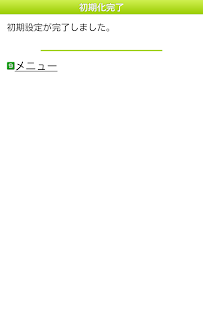 Below that enter in FULL WIDTH KATAKANA the reading: エッス　ビ　エッス. 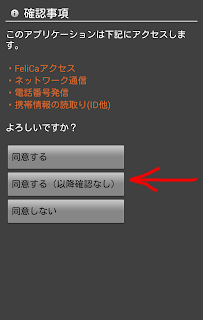 (Note that this works in general for any Japanese web form where it asks for Kanji - just switch to Japanese and enter 2-byte Romaji. PC mail account (keitai mail will also work). 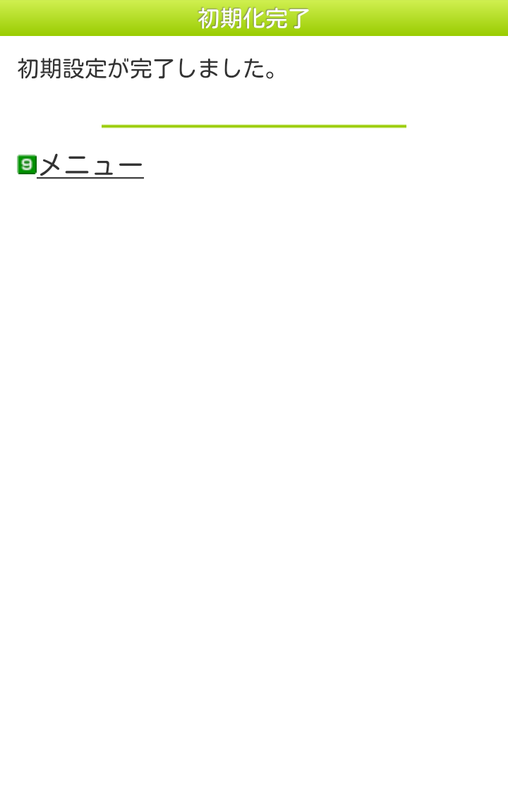 Suica password (6 to 8 half width digits). Answer no to all the email questions, 希望しない. 7. Registration done, don't forget your password. Click next a few times through the next couple of screens, 次へ. The app will connect and register, which might take a minute or so. 8. Setup complete, go to the main menu, メニュー. And behold the ugliness of mobile suica. This is helpful. 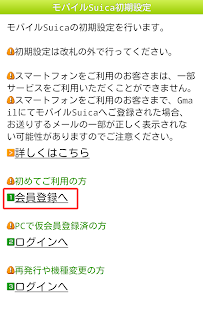 can you explain how to charge the suica also? thanks..
Can it be charged at combini if you aren't using a credit card? I just installed this on both my SC-05D and my Nexus 7. I installed it from the web interface of Google Play, for what that's worth. After the install, though, there was no new icon on my screen nor a new entry in Folder Organizer for unclassified, new apps. All new apps go into both places for me. So, I reboot both devices and check "Settings -- Apps", and there it is. "Osaifu-Keitai" in romaji, on both devices. I can't launch it from there, though, only uninstall it, so I exit Settings, and I click on my Applications launcher and flip through all my apps. It is not there -- on either device. My Nexus 7 is rooted; my SC-05D is not. Why would it disappear like that? Is there a bug in the current version of the app? Ok. You're right. Thanks for the reply. Can you add a credit card later? Charging is as simple as visiting any convenience store, walking up to a checkout counter, and asking "mobile suica charge dekimasu ka?". The store clerk would ask you for how much and you can specify in increments of 1000yen. Hand the money, touch your phone on the scanner and viola! Seems interesting, but I'm trying to find out about the detailed records. 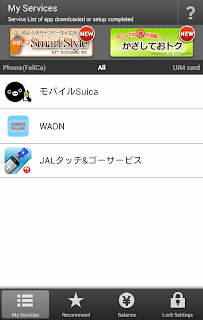 I've been using PASMO for a while, but my new phone could use Mobile Suica... Should I? Too many unanswered questions, but I think the #1 question is about detailed records of my transactions. The data available from PASMO is essentially useless. Convenience without safety is not good... I am rather risk averse. 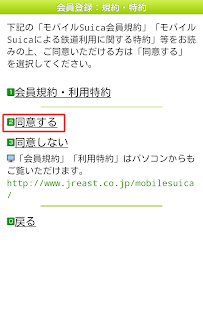 Does Easy Mobile Suica require an active Docomo UIM to work, like with most Osaifu-Keitai appli? Or could I set it up over Wi-Fi before I visit Japan (assuming I have the モバイル Suica app installed) and top it up when I arrive and use a prepaid data SIM? I use an SH-06E as my daily smartphone outside Japan. A couple years ago the hotel concierge set this up on my SC04E and it works great. I can open the app, view my balance and use it for any normal SUICA transaction. Now I'm moving to a new phone and have no idea how to migrate the app and my balance. Does the author have any advice or steps on how to do this?